1 of 3 Line a cookie sheet with parchment or wax paper. Lay doughnuts, smooth side up, on prepared cookie sheet. 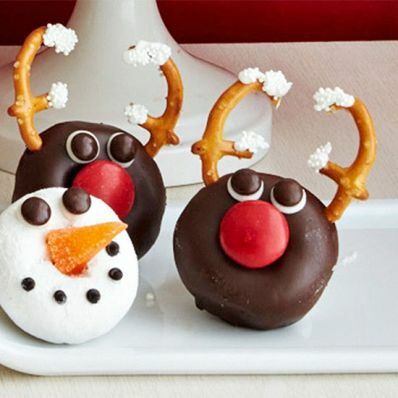 To make antlers, use a small serrated knife to cut 3/4 inch from each rounded side of a pretzel, removing center piece. 2 of 3 Spoon vanilla frosting into a ziplock bag. Press out excess air and seal bag. Snip a small (1/8-inch) corner from bag. Pipe a dot of vanilla frosting into center of doughnut and attach a red candy, flat side down, into frosting as the nose. Pipe 2 dots of frosting on doughnut above nose and attach brown candies as the eyes. 3 of 3 Insert 2 pretzel pieces into top side of doughnut, cut sides facing each other and about 3/4 inch apart, as the antlers. Pipe a few dots of frosting on pretzels and sprinkle with nonpareils. Repeat with remaining doughnuts.